Use the Edit Hole feature to modify the parameters or location of pre-drilled hole. NOTE: This function is not guaranteed to recognize and/or edit partial holes (holes that do not contain a complete circle). Select Edit Hole from the Modify>Solid Feature submenu. Select the hole to edit. The top of the hole will be determined by where you select the hole. The Solid Hole Properties dialog appears, containing two tabbed pages: Parameters and Actions. View the properties of the hole in the Parameters page. In the Actions page, decide how to modify the hole. When finished, click on the OK button option. 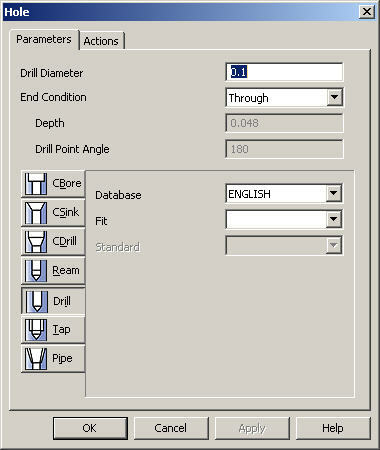 Specify a value for the drill diameter. When checked, you can specify a value for the blind depth of the drill. When Blind Depth is selected (checked), you can specify a value for the drill point angle. For each selection, you can specify a Fit, Standard, Diameter, and Depth. For Tap, you can specify type. For Pipe, you can specify Taper Angle and Pitch. A Fit/Screw Head field displays the fit for the CBore and Drill selections, or the Screw Head field for the CSink and CDrill selections. The Standard combo displays all of the sizes available for the current selection. When this value is changed, most other fields will update to match the database record for that size. Use this setting to move the selected hole to a new location. This option is disabled when multiple holes are selected. Use this setting to remove the current hole. Use this setting to create new holes using the parameters of the selected hole. You will be prompted to select a face into which the new hole will be drilled. This setting allows you modify other, additional holes. Use this setting to modify the current hole using the parameters of another hole. When this setting is chosen, you will be prompted to select the hole whose parameters will be used.